I have been here but not feeling much like blogging. Instead I've been lounging around reading Hilary Mantel and making resolutions to improve myself that are discarded as soon as the sun goes down. 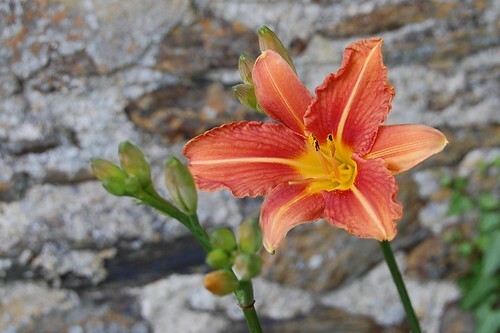 Day lilies (Hemerocallis) are edible and I've eaten the odd one dried from the Chinese supermarket but never summoned the courage to eat any of my own from the garden. Some of this is because there are few enough flowers growing around here as it is and nicking the buds for supper seems unhelpful to horticultural excellence. But the clumps I put in a few years ago are beginning to bulk up now so perhaps I'll buy a couple more fancy ornamental varieties and start eating these very basic type blooms. The squashes are coming along but rather slowly in my opinion. The same can be said of the climbing beans and also the sunflowers. The weather is fine enough if blighted by a continuous north easterly breeze so I'm not sure what the problem is except my own impatience. 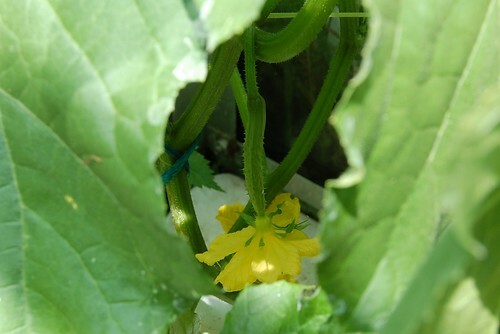 The Golden Nugget squash plant came from a seed that antipodesgirl from Pushing up the Daisies swapped with me in the spring. I've high hopes of it, I don't often grow bush squash but it's sitting nicely in a row with the courgettes and looking good. 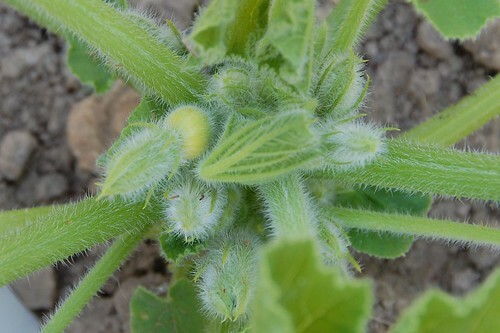 The first baby cucumbers are now beginning to form. A male flower picked off had the most exotic and delicious scent which I wasn't expecting. I think I'm going to have to shade the greenhouse, at least at the end where the cukes are as the leaves are showing some sun burn. I knew it would be difficult to grow cucumbers and tomatoes in the same small 6x10 space but had little option but to give it a go. Still saving for that polytunnel! It's a good cherry year. There's one old cultivated cherry on the farm, looks like a sour Morello type. I've never seen ripe fruit on it before but it has quite a lot of cherries this year. Trouble is they're so high that I don't think I can reach them before the birds do. 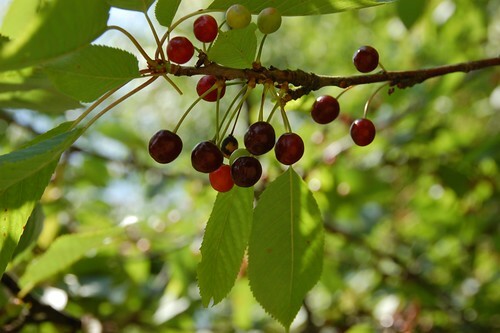 The wild cherries are also in abundant fruit which are richly ripe and almost black in colour. I'd like to harvest some of these tiny but succulent little drupes but unfortunately I was nearly horse flied to death just taking the picture so I'm going to have to plan a strategy quickly to avoid this before the fruit goes over. I didn't realise, or had forgotten, it was the flowers that you ate, rather than the roots. What do they taste like? You can eat the roots too. The dried flowers I've had don't taste of much to be honest, just vegetal with a bit of texture but checking on the roots for you I just found this site which gives a lot of information.